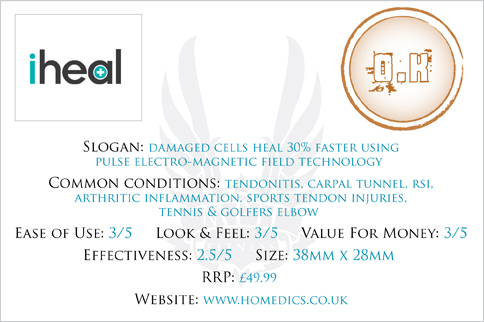 I was approached by Homedics earlier this year to try out a few of their IHeal devices on our clients. As a chronic bad back sufferer for many years I’m always open to finding new and innovative ways of dealing with the stresses of pain whether it’s through manual manipulation or through technology. However, that being said, I’m no pushover and I immediately requested research and case studies that backed up their product. The IHeal uses PEMF technology (Pulsed Electro Magnetic Field) which has been widely used across the world since the 1970’s and more so in Scandinavia, whose clinics report that more than 80% have benefited from the treatment. Does the ‘world’s smallest, most effective & versatile PEMF therapy unit’ work? Let’s see….